A Torch against the Night (2016. 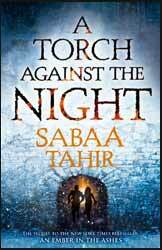 454 pages) is the second in a series of young adult fantasy novels written by Sabaa Tahir. In a book of this type it is often worth deconstructing the work into its three main elements. The first is the story: which defines what happens; plot: how it is told; and the author’s general writing skills. The story is nothing special, the usual standard young adult fantasy fare. Like many authors before Tahir relies on the reader identifying with the two young protagonists as the main way of engaging with the story. Here they are pitted against a mustachioed villain. Ok, so he doesn’t have a moustache to twirl, but he might as well for all of his pantomime evil. The plot unfolds from the different perspectives of the main sympathetic characters. Obviously we get Elias and Laia allowing us insight into both as the attempt to rescue Laia’s brother in Kauf. We also get the perspective of Helene who is both their friend and the person who is charged by the emperor to find and kill Elias and Laia. I can’t say that I remember reading the first novel in the series, An Ember in the Ashes, and this is to the detriment of the current novel. Torch throws you straight into Elaias and Laia’s escape from the city of Serra. For the most part you would expect to be a little lost, but with the certainty that the author will fill in enough of the background, with a certain amount of recap, to draw the reader in. This does not happen. The book contains a surprising lack of description of either the environment, presumably this was all covered in the first book, so Tahir has not felt it necessary to go over old ground again. For anyone picking up this novel, the feeling is that the story is happening in somewhat of a vacuum. I had to guess, from the names, that this is probably set in a Romanesque civilisation, but there is little in the book to either confirm or challenged this belief. For readers of the original novel Tahir expands on the world building. The book is written well and having the narrative told from three different perspectives helps keep the pace up. So, whilst it will win few awards for originality, it does remain a well written adventure.